I’m sorry to say I had to fast forward through Llomincia’s interview as her extensive emphasis on her faith made me uncomfortable. I enjoyed the rest of the episode though I always miss Spanny’s NCAA wrap up when it’s not on the show! How dare she make YOU uncomfortable…geez. Maybe you’re the one with the problem? 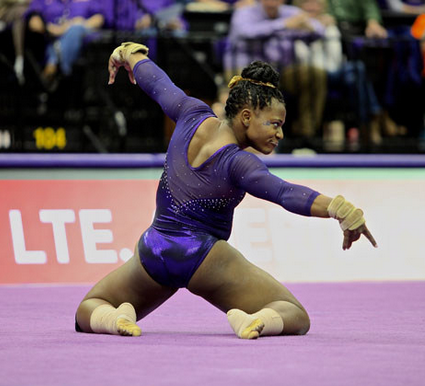 Full ins off beam more recent than Dawes in 96: Besides Biles, I can think of Shawn Johnson, Catalina Ponor and Ohashi actually trains one as well. Speaking as a British person, we don’t compete as the British Empire! I’d love it if we did though – maybe a showdown with the Ottoman and Roman Empires?? The USSR could come too. LOL! Thank for you for the good-natured correction. The equivalent of the “British Empire” meet would be the Commonwealth Games, no? Yup, the Commonwealth is all the countries that used to make up the British Empire – a friendly reminder from those countries that while we used to own them, they can pretty much kick our arses at all sports.